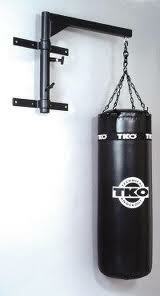 The Heavy Bag Wall Mount attaches to any standard wall and holds up to a 75 lb. bag. The arm extends 27' away from the wall and the holes align for 16' on wall studs. The pull pin conveniently adjusts the swivel to the side when not in use.